Business WashCard is an electronic, card based, authorisation system to assist fleet managers control and administer the washing of all fleet vehicles. It’s quick and hassle free. Download application form , complete and send back to Aquarius CarWash via fax or post. Wait for approval. There is no charge for the WashCard. 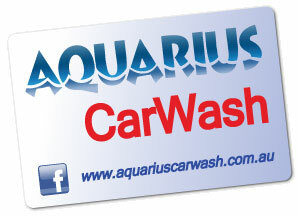 Aquarius CarWash will open your very own WashCard Account Manager. Once inside this secure area you can program your Business WashCard, review or print your account history at any time. Use the Business WashCard to start car wash equipment by inserting and removing the WashCard. Track wash activity by date and time of each wash within the billing period. Thirty (30) day payment terms from the end of the month. You are also entitled to 10% off any professional detail package after 3 months continuous subscription. Plus there are some really special projects & people you will be helping through selected local charities & not-for-profit organisations that we now support. Aquarius is committed to local Community Support. We will donate 5% of your paid Business WashCard account to a variety of locally targeted projects and on-going support work.